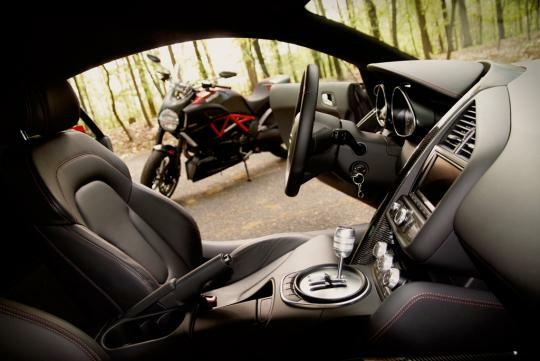 In a recent episode of Autocar, Steve Sutcliffe pitted the German supercar, the 2013 Audi R8 V10 against the Ducati Diavel. For readers' information, the Diavel is the second cruiser motorcycle from Ducati, an Italian company that designs and manufactures motorcycles. Ducati is owned by Audi. Weighing 234kg with a 162bhp, 1198cc two-cylinder engine, the Diavel has a power-to-weight ratio of 692bhp per tonne. At the other corner, the 5.2-litre, 542bhp R8 has a power-to-weight figure of 340bhp per tonne. Looking at the power-to-weight ratio, it looks like the Audi is at a disadvantage. However, this test takes into consideration both acceleration and deceleration of the two vehicles. Who is going to come out on top?